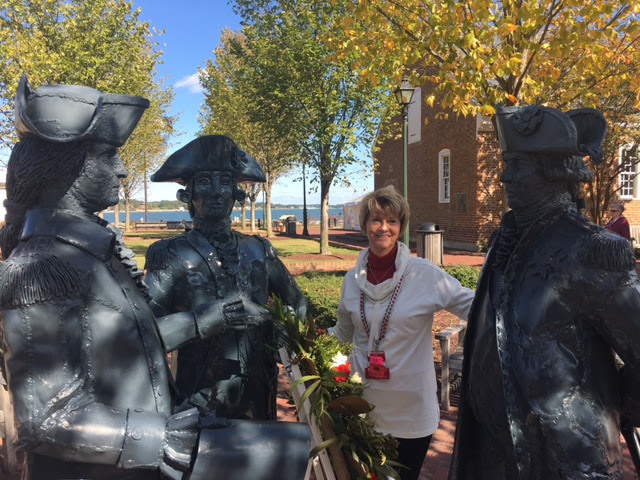 American Revolution Museum at Yorktown – Let's Go RVing! The day started early with the group joining for breakfast at Denny’s. We sat with Jerry and Pam, a couple from Georgia that we have really enjoyed. Our first tour stop was the American Revolution Museum at Yorktown. Jerry and I had visited there in August, 2015 when it was under construction to enlarge and improve the facility. Boy, did they ever. When we were there earlier we wandered around by ourselves but this time we had a guide which gives a lot of insight into the times. We had a very informative and passionate guide who painted an enthralling picture of the not only some of the more famous people of the time but also those less well known. The museum itself is filled with authentic artifacts, displays, living re-enactions and amazing audio visual effects. One of the most outstanding things we saw was a film depicting Cornwallis’ defeat at Yorktown. It was so realistic that as the “smoke” was rising and the lightning was flashing along with the musket firings I found myself quite often flinching. Outside was the re-created Revolution-era farm and Continental Army encampment which had changed a great deal since we were there. There were a number of 6 man tents like those used by General Washington and various displays depicting the life of a soldier. We stopped by the outside kitchen where one member of the 6 man team would prepare the meal. Only one meal a day was prepared and then I guess leftovers provided the other meals of the day. Meals were prepared whether the weather was cold or drizzling rain. The only thing that prevented the preparation was a deluge of rain. Otherwise the job continued. Despite it being a late October “Fall” day the wind was blowing and it was pretty cold outside so we didn’t linger too long at the Encampment Farm but scurried inside. Since it was near lunch time we considered eating in the café there on site but decided to ride on in to Yorktown. 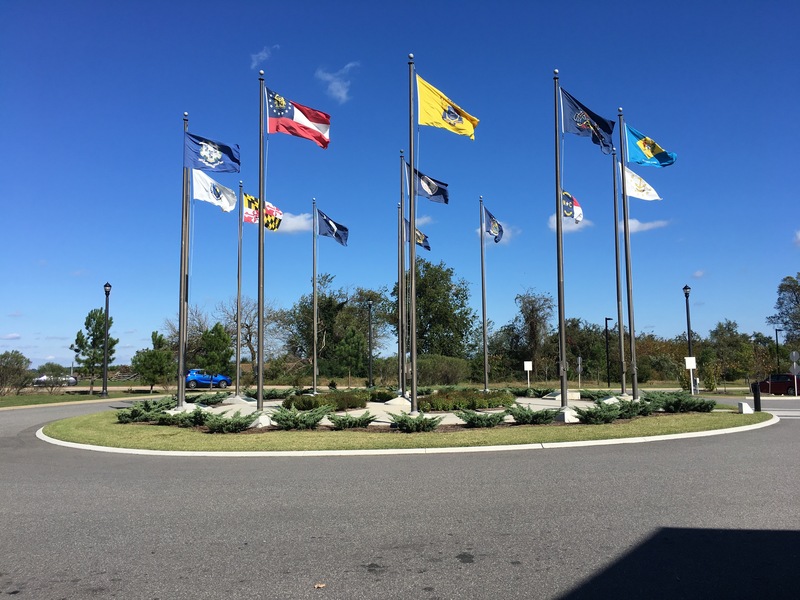 After a ride through the battlefield seeing several fortifications and cannons and remembering our drive of August, 2015 we ended up at the Coast Guard Training Center where ALL ID’s where checked. Reassuring but since we had no business there we turned around and headed out. That was when we saw three deer wandering around with no evident fear of activity. We wondered if possibly we were in a protected area with no hunting as we had seen deer before on our visit and they do seemed very accustomed to activity. Next we headed to the museum where we had bought our America the Beautiful pass two years prior. What a deal. At the time we bought it it was only $10 and even though it is now $80 it is still quite a bargain as you are allowed free entrance into all national parks. Oh yes, the one caveat – you have to be 62 or older! The lady at the admissions counter asked us about our NKK (Newmar Kountry Klub) badges so we talked with her for a few minutes. She is interested in buying an RV and in particular interested in Newmar. Of course we told her all about the virtues of Newmar. We went in the gift shop where I remarked on the Passport books for national parks. As I said “we should have bought one of these four years ago” Jerry said, “well, let’s do it now” so we finally got our passport book and will begin to fill in the national parks we have visited. 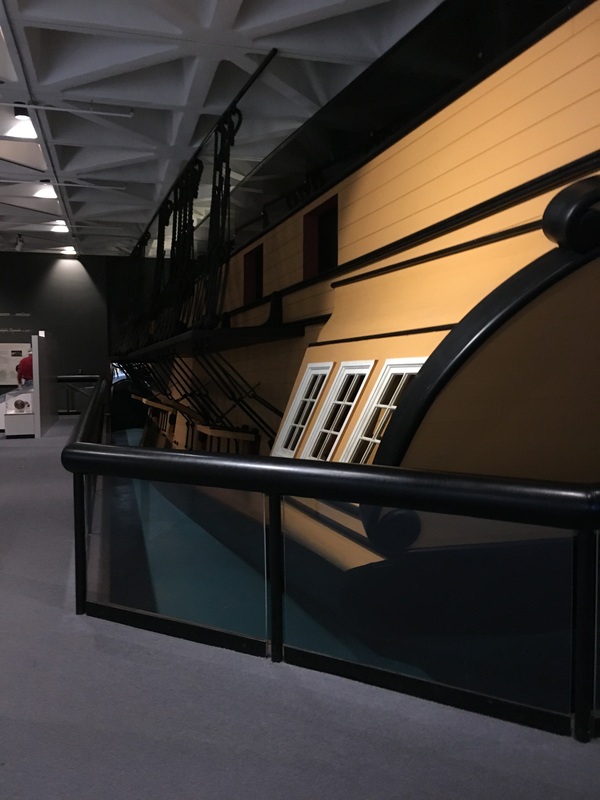 Inside the small museum is a one fourth replica of the HMS Charon, a British ship which houses some of the ship’s cannon that were recovered from the river in the 1930’s. According to the poster outside “On the night of October 10, French artillerists along the York River west of Yorktown turned their attention toward British ships anchored in the river, including the 44 gun Frigate the HJM Charon. Firing “red hot shot” that were super-heated cannon balls, they set fire to the Charon. Attempting to escape, the Charon collided with a transport, spreading the intense fire. The Charon drifted to the Gloucester side of the river where it burned to its waterline and sank.” Inside the displayed ship was a rimmed table with a one place setting with a pewter plate and the same stainless that we use! By this time we were really getting hungry so we went back into Yorktown searching for a restaurant. We didn’t think we had a lot of time to spare as we were heading to Hampton for the evening and we were unable to find a restaurant that didn’t have a wait time. I had earlier looked at the menu at the American Revolution Museum café so I suggested that we go back there. The entrée’s sounded good and were reasonably priced. I got a bacon, tomato, lettuce and cheese sandwich which was quite good. Although I had never heard of putting cheese on a BLT I think I’ll be trying it in the future. We left in plenty of time to get to Hampton since we had been told that it would take some time getting there depending on the traffic. Well we got there before 3:00 and were not supposed to meet our group until 5:45. We rode around the town a bit and then found a parking place and just relaxed for a little bit.